Ronald Robertson, MD, chief of the Division of Trauma, Critical Care and Acute Care Surgery in the University of Arkansas for Medical Sciences (UAMS) College of Medicine, has overseen major growth in both the number of patients and the number of trauma certified physicians on staff since he took over as medical director of the Arkansas Trauma System in 2013. The only adult Level One Trauma Center in the state that takes care of the sickest patients saw 1,600 trauma activations and had three trauma surgeons when Robertson took over the program. In 2017, the number of trauma activations had increased to 2,784 for the year and staff had grown to nine full-time physicians with additional training in trauma, critical care and acute care surgery. "The program has grown considerably," Robertson said. "It has been very fulfilling. We have been able to hire some of the most skilled trauma surgeons in the country who have trained at some of the best trauma programs in the country. Outside of UAMS, there is not another hospital in the state with fellowship-trained trauma surgeons. We have a unique ability to take care of the trauma situation." Robertson, a native of Kansas City, Mo., was raised on a farm and initially intended to become a veterinarian. But while attending the University of Arkansas at Fayetteville, he became more interested the health of people. Then, while doing his residency at UAMS, he was mentored by two physicians passionate about trauma care, John Cone, MD, and Terry Collins, MD. "I was totally enthralled by trauma patients," Robertson said. "I have always enjoyed taking care of sicker patients. I love the notion that I don't know what is coming through the door next. I am a bit of an adrenaline junkie. I decided trauma was where I wanted to be." 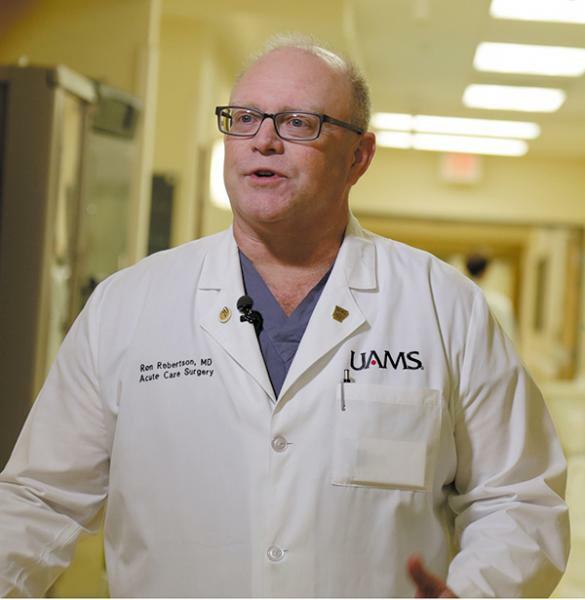 Robertson, who has been on the UAMS faculty since 1996, said the types of trauma they treat break into two major categories: blunt injuries from falls, and motorcycle, car and ATV accidents, and penetrating injuries such as gunshot and knife wounds. About 80 percent of their cases are blunt and 15 percent penetrating. UAMS is unique having the only true tertiary trauma referral center in the state at the only academic medical center in the state. "Geographically, we are located in the center of the state, so everything tends to flow in to us," Robertson said. "On the edges of the state, there are other trauma centers that help but, by and large, we provide the largest amount of trauma care to patients in Arkansas." Robertson said Arkansas was a bit late to the game developing a statewide trauma system. But that allowed the people involved in the development of the trauma system launched in 2010 to look at every other system in the country for ideas about how to have the best integrated statewide trauma system. "By doing so, we are now considered to have one of the best trauma systems in the country," Robertson said. "We have a centralized trauma call center, and can get patients with special needs to the right place at the right time. We have a statewide trauma registry, and every trauma patient gets a trauma wrist band that follows the patient from pre-hospital to hospital and discharge. This allows us to query our data registry and find out where our problems are and formulate a corrective plan to fix any problems." There is also a trauma image repository of CT scans done in any trauma center around the state. Whatever hospital receives that patient can pull those images into their facility. "It allows us to streamline care and become much more efficient, which is particularly important for injuries that are time sensitive such as people with serious brain injuries or bleeding in the abdomen," Robertson said. "It allows us to provide the best care possible for those patients. It also prevents people from having radiation exposure twice. There are cost savings, patient benefits and a physician benefit from the standpoint we know early on what we are dealing with. We formulate a plan before the patient ever gets here." A study done by UAMS faculty published in the Journal of the American College of Surgeons in April 2017 estimates that implementation of a statewide trauma system in Arkansas reduced the rate of preventable deaths due to injuries nearly in half over five years and saved 79 lives over a 12-month period. "From their analysis of the economic impact of lives saved, the study investigators concluded that the Arkansas Trauma System annually saved $186 million, giving state taxpayers a roughly ninefold return on investment from the $20 million per year in public funding the system has received," the study authors said. Robertson also oversees a program called Stop the Bleed teaching police and others how to do tourniquets for gunshot wounds in the field. "Unfortunately, our country has suffered mass shooting and multiple casualty events," Robertson said. "What we have learned as we have studied those is to have the biggest impact in those type of events, you need to provide the first responders with the ability to control the bleed. People suffering from life-threatening hemorrhage can die within four or five minutes. If we can arm people with knowledge about how to appropriately apply a tourniquet, we have the best opportunity to save these patients' lives." The Stop the Bleed program has been used to train state police and Little Rock police, and they are currently working on training teachers around the state. "Our goal is to try to make this as broad a scope as we can, and impact the largest number of Arkansans we can, to arm them with that knowledge if they are ever in that situation to be able to help someone else," Robertson said. Another important development with trauma has been to develop multi-modal pain therapy utilizing anti-inflammatory medicine, peripheral pain blocks and narcotics. "Everyone is aware of the opioid crisis and trying to move away from prescribing narcotics," Robertson said. "By using multi-modal pain therapy, the need for narcotic usage is dramatically decreased." Robertson and his wife, Carla, are empty nesters with four adult children. They enjoy being outside, hiking and photography. They like to travel and especially enjoy Mexico. "We travel, but we always enjoy being able to explore Arkansas," Robertson said. "Arkansas is a breathtaking state and so much is offered here. I also work on cars. Things like that sort of allow me to escape and not be locked into being a doctor 100 percent of the time." Robertson was the recipient of the Robert M. Bransford, MD, Memorial Award for Outstanding Chief Resident in General Surgery in 1995 as well as the Society of Laparoendoscopic Surgeons Resident Achievement Award winner in 1994.